Your tortoise is a cold blooded creature. This means they are unable to maintain an independent body temperature like mammals do, and instead rely on the temperature of their environment. So when the temperature starts to drop as we approach the winter months, your tortoise will start preparing to hibernate. This preparation usually begins in the autumn. It is important at this time to get your tortoise checked by a vet to confirm they are fit and healthy enough to hibernate. Your vet will check for any illness in your tortoise and whether they are the correct weight. Your tortoise will not eat during the hibernation period, so they must have sufficient body fat reserves to support them during this time. Their body systems slow right down as they go into a deep sleep and this includes their immune system so they must be healthy. So as the temperature starts to drop below 15oC and the daylight length gets shorter your tortoise will gradually decrease the amount of food it consumes. They will generally have a starvation period of 3-4 weeks before they hibernate. This allows their gut to be empty when they go into hibernation as food sitting in their stomach for a couple of months will go mouldy! During this period you should also bathe your tortoise regularly to allow them to drink and maintain hydration. A small cardboard box is ideal. The bedding you use for your tortoise should offer insulation and ventilation (for example shredded paper). Place this box inside a larger box and pack the space between the two boxes with newspaper to provide extra insulation. When the temperature increases as spring approaches your tortoise will begin waking up. The total hibernation period should not exceed 20 weeks (4.5 months). When the temperature reaches above 15 oC your tortoise will start waking up. Once this starts you need to gradually warm them over several hours. Place them in a bright and warm environment. Once they are more awake start bathing them twice daily to encourage them to drink and to go to toilet. It is a good idea to record these activities over the next few weeks. If your tortoise has not eaten in a week or not had anything to drink 24-48hrs after waking it is important that you take them to see your vet. Your vet can do a post hibernation exam on your tortoise. This includes a clinical exam for signs of illness and a weight check. They will check that the hibernation went smoothly. They may take a blood sample from your tortoise or start supportive treatment if necessary. 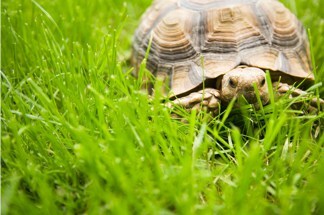 Certain breeds of tortoise should not be hibernated. Also tortoises that are too young or underweight or have an illness should not be hibernated. In this case you will need to provide a suitable warm environment over the winter to keep your tortoise awake. Light and heat should be supplemented and regular bathing should be continued. Ask your vet for more advice.